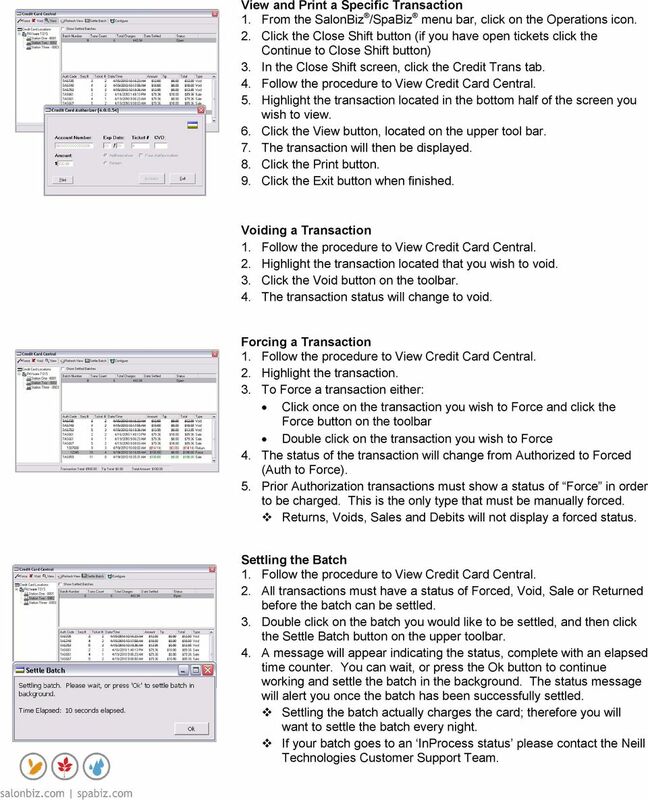 Download "credit card version 6"
1 credit card version 6 Use this guide for SalonBiz /SpaBiz Virtual Black Box Version 6. Authorizing a Credit Card Sale 1. Create a ticket for the client as usual; select the appropriate credit card payment type to open the Credit Card Authorizer. 2. Swipe the credit card. 3. Verify the ticket number; it will automatically appear in the Ticket # field. If you have manually entered (typed) the card number in the Account Number field you will need ed to enter in the CVD number; the last 3 digits on the back of the card. For American Express cards this is on the front of the card. 4. Verify the sale amount; it will automatically appear in the Amount field. 5. Enter tip amount (optional) in the Tip field. 6. Check the Authorization field; you will see a black dot. 7. Click the Authorize button. You should see the transaction progress at the bottom of the screen. If you have selected the incorrect credit card type you will receive an error message. Click the Ok button and either swipe the appropriate card or close the credit card authorizer and select the correct card type from the ticket. 8. A message will prompt you indicating the transaction has been 9. Both a Customer and Merchant receipt will print out. 10. If the client chooses to include a gratuity on the receipt, enter the gratuity amount in the Tip field and then click the Update Tip button. 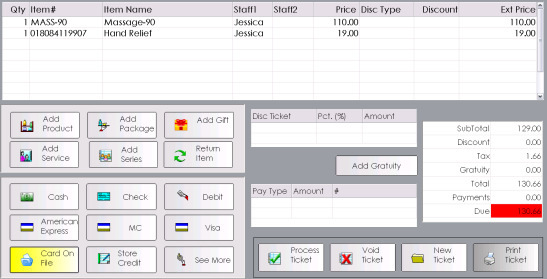 Use the Add Gratuity button on your SalonBiz ticket to assign the tip amount to the appropriate staff members. 11. Click the Exit button to close out of the Credit Card Authorization screen. Click the Process Ticket button to continue to process the ticket as usual. 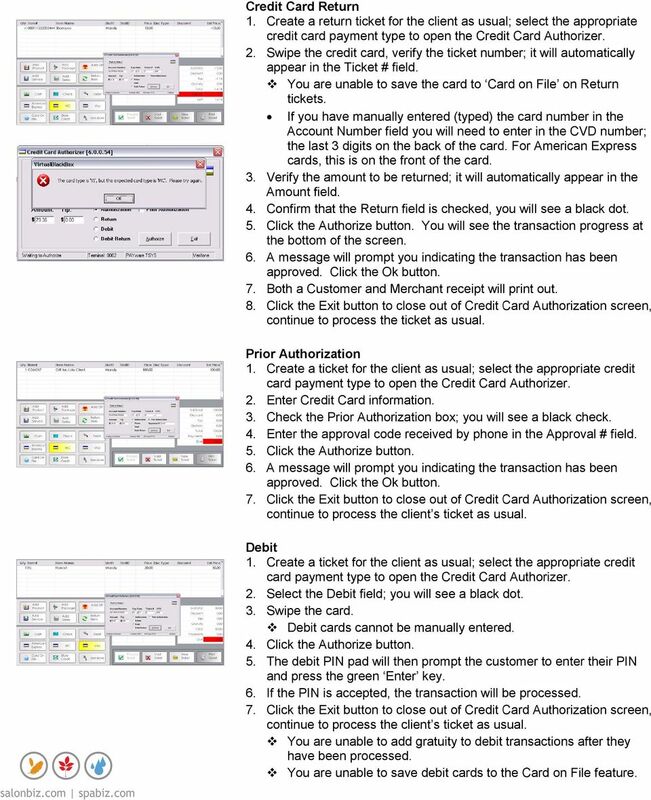 If you need to void a ticket, you can choose to also void the credit card transaction at the same time. 2 Adding a Gratuity from a Ticket 1. From the ticket, double click on any part of the complete payment line in the Pay Type Amount field. In version 4.5, gratuity may not be edited from this field on processed tickets, you must update gratuity on processed tickets through the Credit Card Central screen. In version 4.9, gratuity may be added to an open ticket, a processed ticket and/or any non-voided ticket in Edit mode. 2. Clicking the Pay Type Amount field will prompt the Credit Card Authorizer to appear giving you the ability to enter the tip amount. 3. Enter a tip amount, and then click the Update Tip button. 4. Click the Exit button. 5. A message will prompt you indicating that the tip has been updated. Click the OK button, and then click the Exit button. Adding a Gratuity from the Operations icon 1. From the SalonBiz /SpaBiz menu bar, click on the Operations icon (Sun/Moon). 2. Click the Close Shift button (if you have open tickets click the Continue to Close Shift button). 3. In the Close Shift screen, click the Credit Trans tab. 4. Double click on the Credit Card Location field, located in the upper left hand frame. The salon name will be displayed, double click on it. 5. If you have multiple credit card terminals, a list of them will drop down; double click on the terminal with the processed transaction. 6. The open batch will list in the batch field, located in the top portion of the screen. 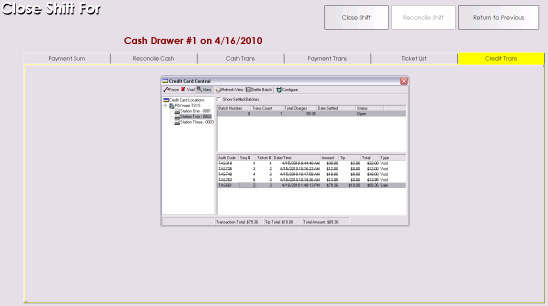 Single click on the open batch, this will display all transactions in the lower portion of the screen. 7. Highlight the transaction located in the bottom half of the screen that you wish to update, and then click the View button on the toolbar. 8. Click the Update Tip button. 9. Select the appropriate staff member(s), and then add the tip amount. Finally, click the Add button; this will update both the credit card transaction and the sales ticket. 10. If you have a gratuity listed you may delete it by highlighting it and clicking the Remove button. 11. Click the Exit button. 12. A message will prompt you indicating that the tip has been updated. 13. Click the OK button. 3 Credit Card Return 1. Create a return ticket for the client as usual; select the appropriate credit card payment type to open the Credit Card Authorizer. 2. Swipe the credit card, verify the ticket number; it will automatically appear in the Ticket # field. You are unable to save the card to Card on File on Return tickets. If you have manually entered (typed) the card number in the Account Number field you will need to enter in the CVD number; the last 3 digits on the back of the card. For American Express cards, this is on the front of the card. 3. Verify the amount to be returned; it will automatically appear in the Amount field. 4. Confirm that the Return field is checked, you will see a black dot. 5. Click the Authorize button. You will see the transaction progress at the bottom of the screen. 6. A message will prompt you indicating the transaction has been 7. Both a Customer and Merchant receipt will print out. 8. 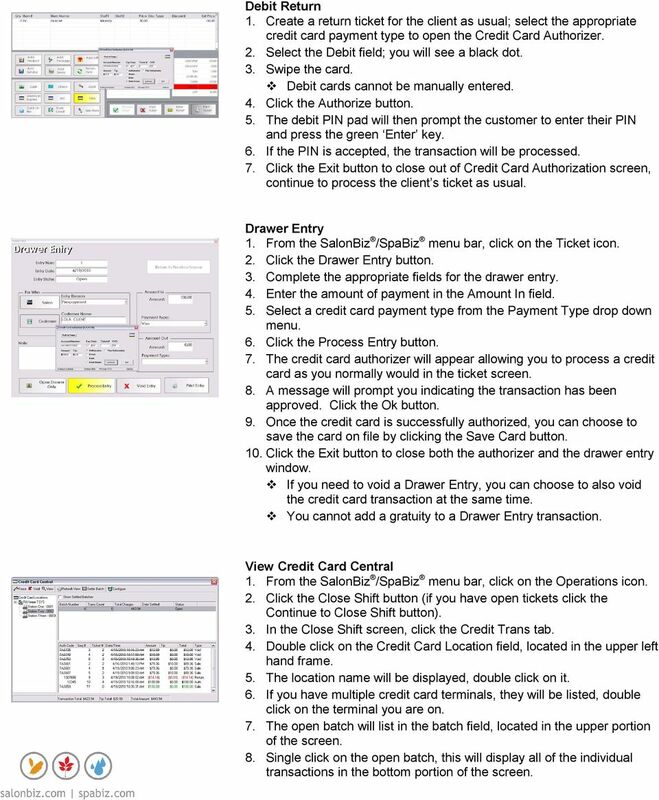 Click the Exit button to close out of Credit Card Authorization screen, continue to process the ticket as usual. Prior Authorization 1. Create a ticket for the client as usual; select the appropriate credit card payment type to open the Credit Card Authorizer. 2. Enter Credit Card information. 3. Check the Prior Authorization box; you will see a black check. 4. Enter the approval code received by phone in the Approval # field. 5. Click the Authorize button. 6. A message will prompt you indicating the transaction has been continue to process the client s ticket as usual. Debit 1. Create a ticket for the client as usual; select the appropriate credit card payment type to open the Credit Card Authorizer. 2. Select the Debit field; you will see a black dot. 3. Swipe the card. Debit cards cannot be manually entered. 4. Click the Authorize button. 5. The debit PIN pad will then prompt the customer to enter their PIN and press the green Enter key. 6. If the PIN is accepted, the transaction will be processed. continue to process the client s ticket as usual. You are unable to add gratuity to debit transactions after they have been processed. You are unable to save debit cards to the Card on File feature. 4 Debit Return 1. Create a return ticket for the client as usual; select the appropriate credit card payment type to open the Credit Card Authorizer. 2. Select the Debit field; you will see a black dot. 3. Swipe the card. Debit cards cannot be manually entered. 4. Click the Authorize button. 5. 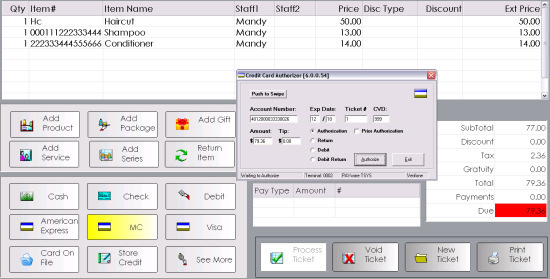 The debit PIN pad will then prompt the customer to enter their PIN and press the green Enter key. 6. If the PIN is accepted, the transaction will be processed. continue to process the client s ticket as usual. Drawer Entry 1. From the SalonBiz /SpaBiz menu bar, click on the Ticket icon. 2. Click the Drawer Entry button. 3. Complete the appropriate fields for the drawer entry. 4. Enter the amount of payment in the Amount In field. 5. Select a credit card payment type from the Payment Type drop down menu. 6. Click the Process Entry button. 7. The credit card authorizer will appear allowing you to process a credit card as you normally would in the ticket screen. 8. A message will prompt you indicating the transaction has been 9. Once the credit card is successfully authorized, you can choose to save the card on file by clicking the Save Card button. 10. Click the Exit button to close both the authorizer and the drawer entry window. If you need to void a Drawer Entry, you can choose to also void the credit card transaction at the same time. You cannot add a gratuity to a Drawer Entry transaction. View Credit Card Central 1. From the SalonBiz /SpaBiz menu bar, click on the Operations icon. 2. Click the Close Shift button (if you have open tickets click the Continue to Close Shift button). 3. In the Close Shift screen, click the Credit Trans tab. 4. Double click on the Credit Card Location field, located in the upper left hand frame. 5. The location name will be displayed, double click on it. 6. If you have multiple credit card terminals, they will be listed, double click on the terminal you are on. 7. The open batch will list in the batch field, located in the upper portion of the screen. 8. Single click on the open batch, this will display all of the individual transactions in the bottom portion of the screen. 5 View and Print a Specific Transaction 1. From the SalonBiz /SpaBiz menu bar, click on the Operations icon. 2. Click the Close Shift button (if you have open tickets click the Continue to Close Shift button) 3. In the Close Shift screen, click the Credit Trans tab. 4. Follow the procedure to View Credit Card Central. 5. Highlight the transaction located in the bottom half of the screen you wish to view. 6. Click the View button, located on the upper tool bar. 7. The transaction will then be displayed. 8. Click the Print button. 9. Click the Exit button when finished. Voiding a Transaction 2. Highlight the transaction located that you wish to void. 3. Click the Void button on the toolbar. 4. The transaction status will change to void. Forcing a Transaction 2. Highlight the transaction. 3. To Force a transaction either: Click once on the transaction you wish to Force and click the Force button on the toolbar Double click on the transaction you wish to Force 4. The status of the transaction will change from Authorized to Forced (Auth to Force). 5. Prior Authorization transactions must show a status of Force in order to be charged. This is the only type that must be manually forced. Returns, Voids, Sales and Debits will not display a forced status. Settling the Batch 2. All transactions must have a status of Forced, Void, Sale or Returned before the batch can be settled. 3. Double click on the batch you would like to be settled, and then click the Settle Batch button on the upper toolbar. 4. A message will appear indicating the status, complete with an elapsed time counter. You can wait, or press the Ok button to continue working and settle the batch in the background. The status message will alert you once the batch has been successfully settled. Settling the batch actually charges the card; therefore you will want to settle the batch every night. If your batch goes to an InProcess status please contact the Neill Technologies Customer Support Team. 6 Viewing a Settled Batch 2. Place a check in the Show Settled Batches field. 3. Double click on the batch you wish to view. Running the Batch Report 1. From the SalonBiz /SpaBiz menu bar, click on the Reports icon. 2. 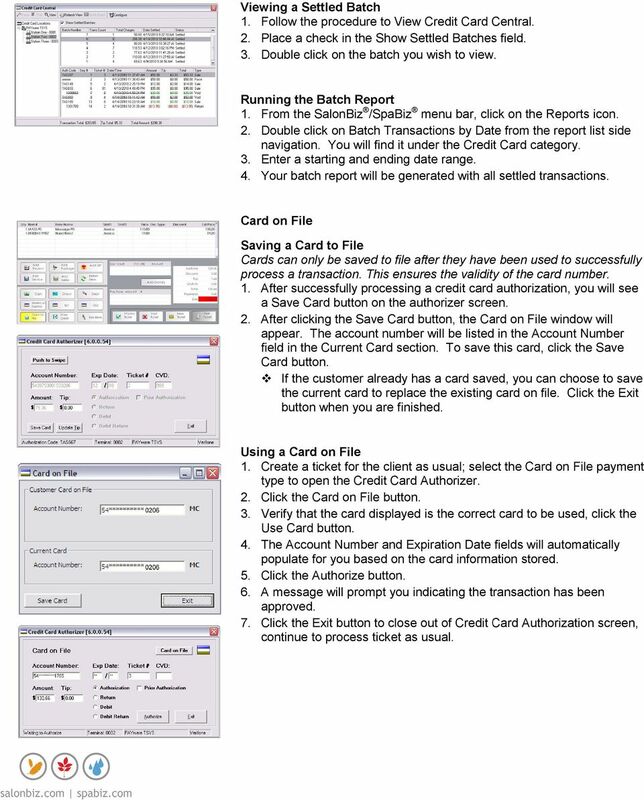 Double click on Batch Transactions by Date from the report list side navigation. You will find it under the Credit Card category. 3. Enter a starting and ending date range. 4. Your batch report will be generated with all settled transactions. Card on File Saving a Card to File Cards can only be saved to file after they have been used to successfully process a transaction. This ensures the validity of the card number. 1. 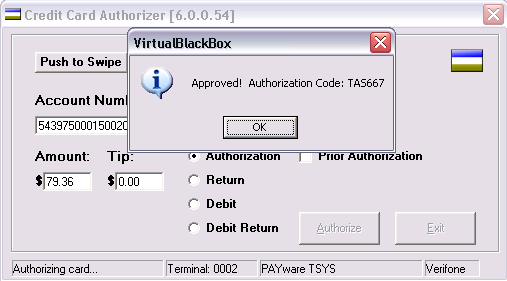 After successfully processing a credit card authorization, you will see a Save Card button on the authorizer screen. 2. After clicking the Save Card button, the Card on File window will appear. The account number will be listed in the Account Number field in the Current Card section. To save this card, click the Save Card button. 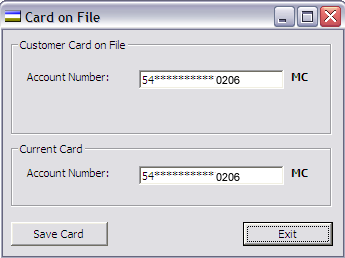 If the customer already has a card saved, you can choose to save the current card to replace the existing card on file. Click the Exit button when you are finished. Using a Card on File 1. 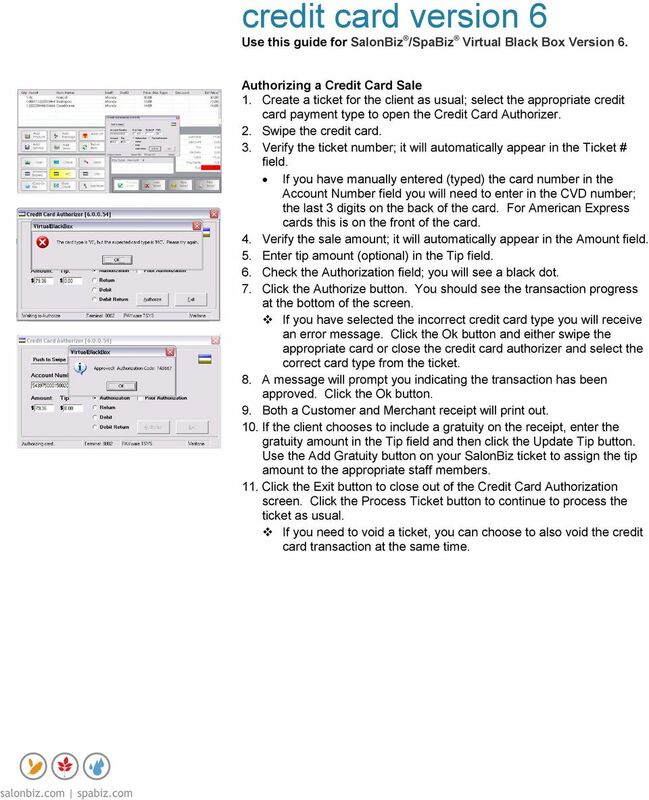 Create a ticket for the client as usual; select the Card on File payment type to open the Credit Card Authorizer. 2. Click the Card on File button. 3. Verify that the card displayed is the correct card to be used, click the Use Card button. 4. The Account Number and Expiration Date fields will automatically populate for you based on the card information stored. 5. Click the Authorize button. 6. A message will prompt you indicating the transaction has been approved. continue to process ticket as usual. security The security feature enables you to secure specific locations and track which staff members are using which functions. Customers can use debit cards for order payment. However, the implementation is significantly different for U.S. and Canadian shops. Demonstration 2014 1 Creating your Merchant Portal Login 1. Before using WorldPay Mobile, you will need to create a Merchant Portal account by going to Portal.WorldPay.us and clicking Create My Account. Merchant e-solutions Multi-Merchant Master Account User Guide Merchant e-solutions January 2014 This publication is for information purposes only and its content does not represent a contract in any form. Elavon Payments App. Revolutionising digital interaction. ... This page intentionally left blank... Print in duplex mode (front and back) to avoid printing this page on separate sheet.